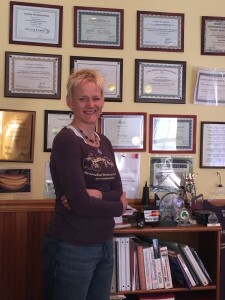 Joanna Chodorowska is a sports nutrition coach, intuitive healer, and competitive athlete. As an athlete herself, she knows the importance of nutrition for a healthier, more fit athlete. She helps you incorporate healthier options that she has also tried herself. The challenges endurance athletes have with food choices, training twice a day, dehydration, race day nutrition, and time constraints. If you want raw food, vegan, gluten free, balanced macro nutrients needs or an anti-inflammatory plan, Joanna can help you combine the right choices for your busy schedule to help you reach your full performance potential! The body is amazing – it can heal from any malaise; give it the proper tools (nutrition is one of those tools) and it will heal.This catapulted Joanna into the field of nutrition where she now helps athletes and non-athletes become more healthy through changing their eating habits as they becoming aware of how they feel eating certain foods. During her bout with adrenal exhaustion, she suffered from PMS, headaches, GI distress, bloating, gas, indigestion, IBS, acid reflux, constipation, diarrhea, hypoglycemia, depression, gluten intolerance, reflux, fatigue, muscle aches, difficulty breathing and dehydration to mention a few. With all these symptoms and conditions as something she has experienced, Joanna can help her clients better understand their issues and how to resolve them easier. In 2012, Joanna was diagnosed with a degenerative hip condition which required surgery. During this time of great pain and discomfort, Joanna used Nutrition Response Testing to help identify inflammatory components of her diet. She also perfected the anti-inflammatory diet and achieved no pain status 10 days before surgery. She learned you CAN indeed eliminate pain by changing your foods! She also learned to savor the things she could do, not depress herself with what she could not. The Path To Heal sessions also alleviated sub conscious emotions which held onto the pain. including local/ seasonal foods, ancestry, blood type, raw, vegan, omnivore, Paleo, anti-inflammatory and alkalizing plans, juicing and The Path To Heal to work with her clients. Joanna looks at the body as a whole including the mental, emotional and chemical stresses one may be experiencing. She understands the needs of athletes from hydration, sports nutrition, nutrient timing, recovery meals, battling fatigue and endurance training. She wants to help you before you develop a similar condition! To schedule an appointment, call Joanna at 215-272-6774. Change your nutrition….change your life!